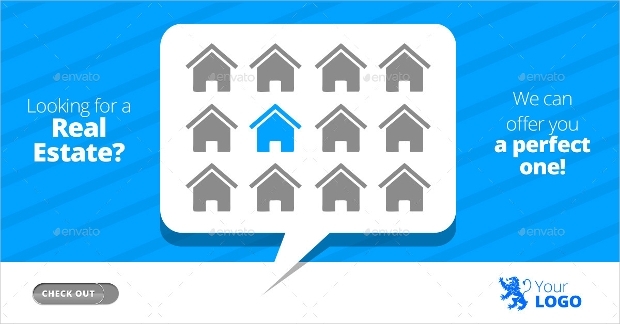 The real estate market has been growing from the time when humans came up with a way of creating shelter for themselves. While the idea of real estate may seem to be of recent origin, the concept of housing has a long history. 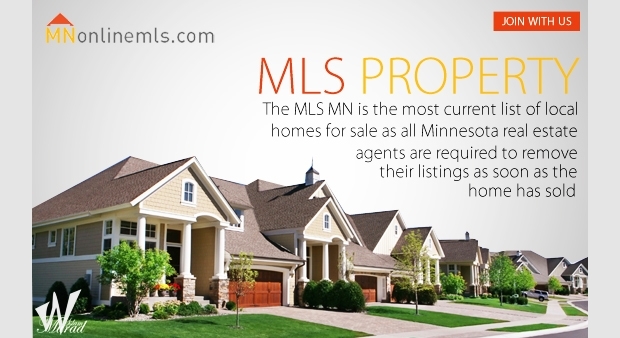 Banners can be an easier and effective way of marketing your real estate business. 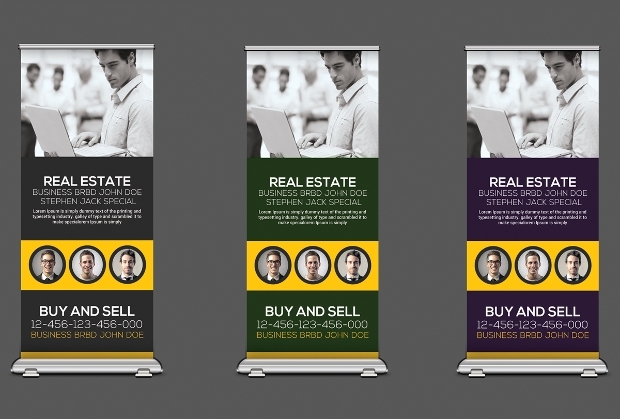 With the right real estate banner template, designing a banner ideal for your business is sheer fun and fast. This pack of elegant banner designs features very sharp banners, thanks to their notable high resolution. 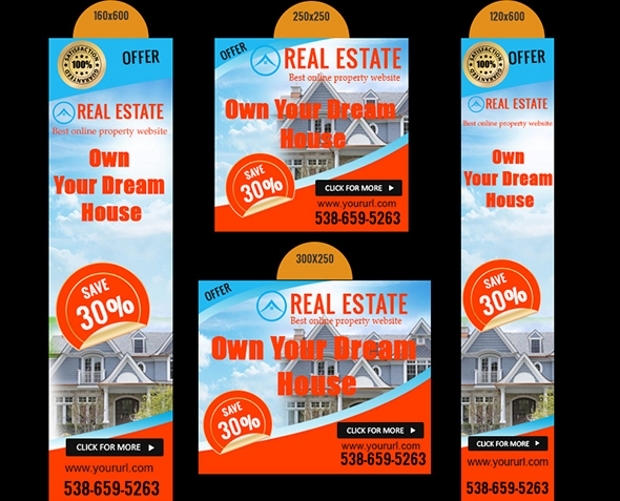 Whether you are in the real estate or real estate agency business, you will find these banner designs quite ideal for promoting your company professionally especially in the social media networks such as Instagram and Facebook. 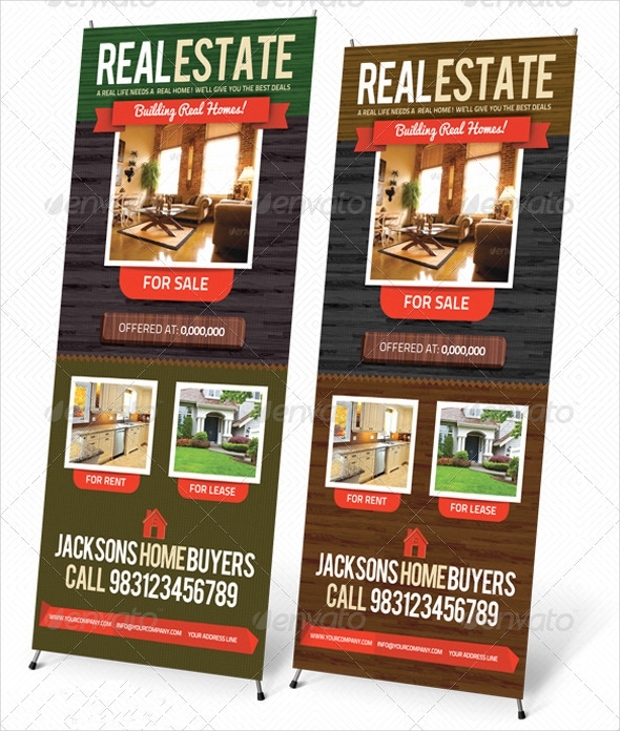 This template is likely to make the rollup banner of your real estate to stand out elegantly. It comes in impressive CMYK color mode and a resolution quality of 300 DPI. Replacing the images or text in the editable template is quite effortless. It is available in layered PSD file format. 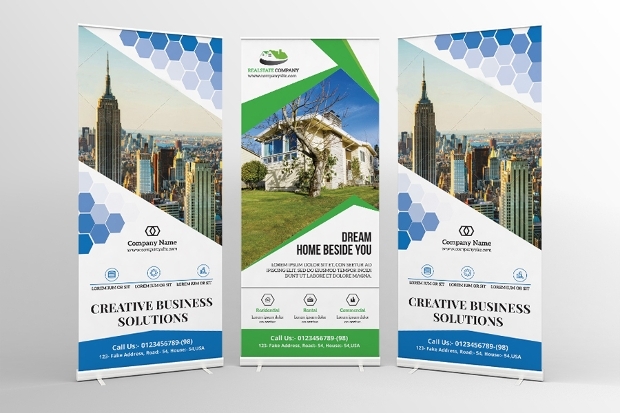 If you are looking for an outstanding roll up banner design for marketing your real estate business or agency, then this could be the most appropriate style to consider. This Photoshop PSD file template is available in a size of 30 x 70in with 1 in bleed. 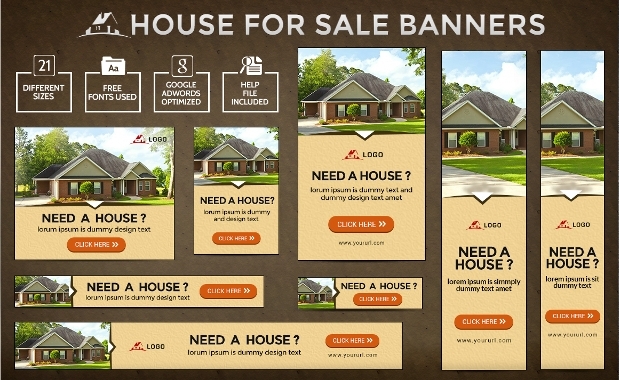 This set of assorted nice-looking banner design sizes can be a perfect way of promoting your real estate business or agency professionally. Available in layered Photoshop PSD format, these banner templates are fully editable. You can use these awesome designs as web banners or Google adwords. This roll up banner design looks really gorgeous! 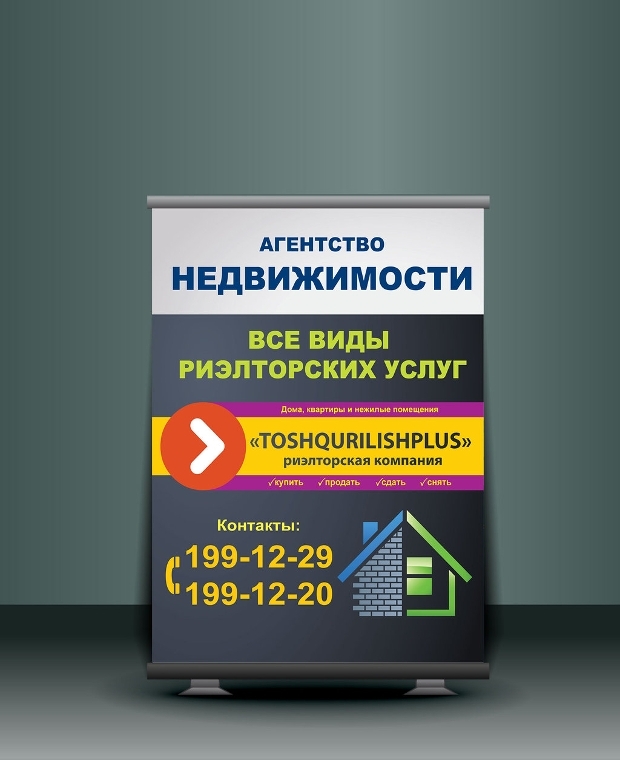 You can use this high quality print-ready banner to promote your real estate agency in a professional, catchy manner. Editing and customizing this layered PSD file format banner design is easy thanks to the smart object placeholders. 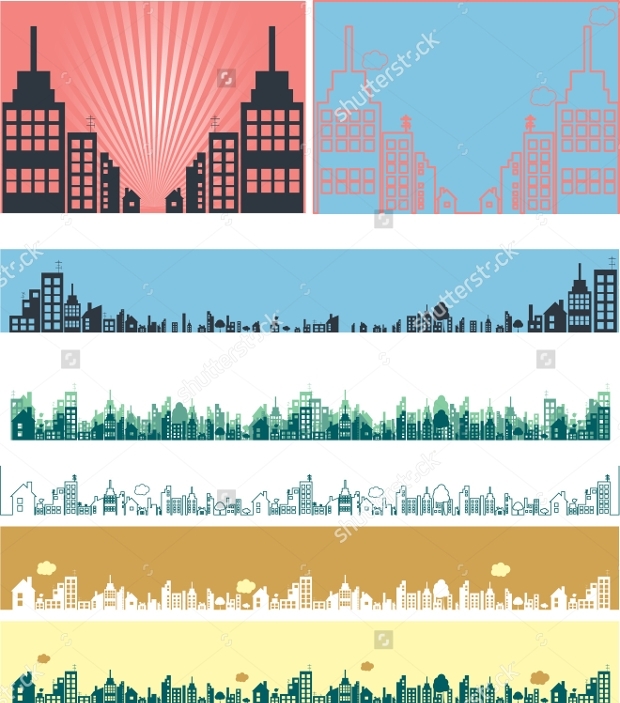 The vector banners featuring buildings looks quite awe-inspiring especially with the blue background. 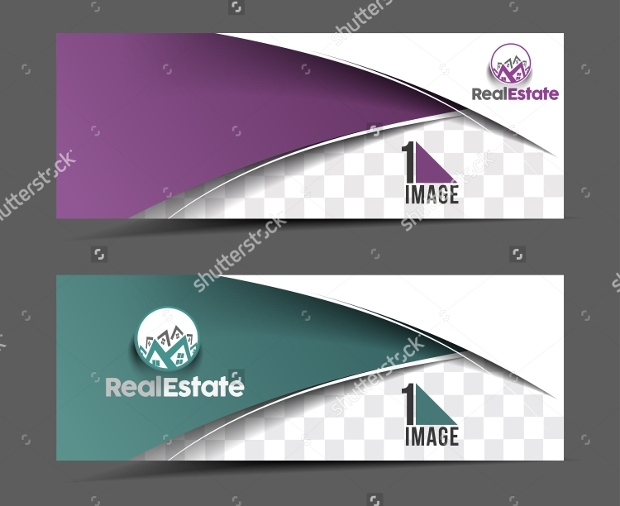 They are available in impressively high resolution, an attribute that makes them ideal for promotion of your assorted real estate businesses or agencies. Re-sizing the banner to meet the requirements of your business is quite easy. 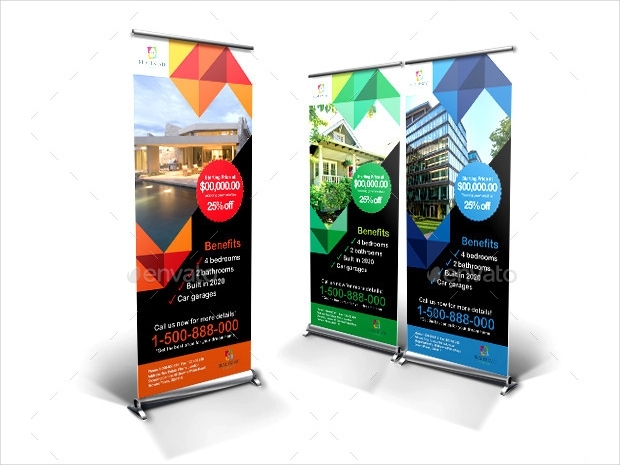 This set features banners with standard dimensions, which are also ideal for Google adwords banners. Changing the text, color and images of these layered PSD files to meet the requirement of your business is quite easy. Elements in this file are fully organized to enhance editing and customization. 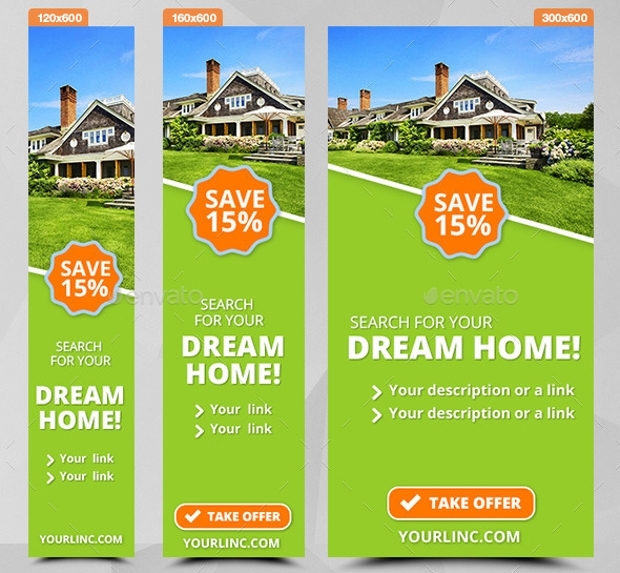 Marketing of your real estate can be made quite easy with this colorful rollup banner design. The assorted objects in this template are in separate layers which are neatly grouped and labeled. The highly customizable templates are available in vector EPS and AI illustrator file formats. 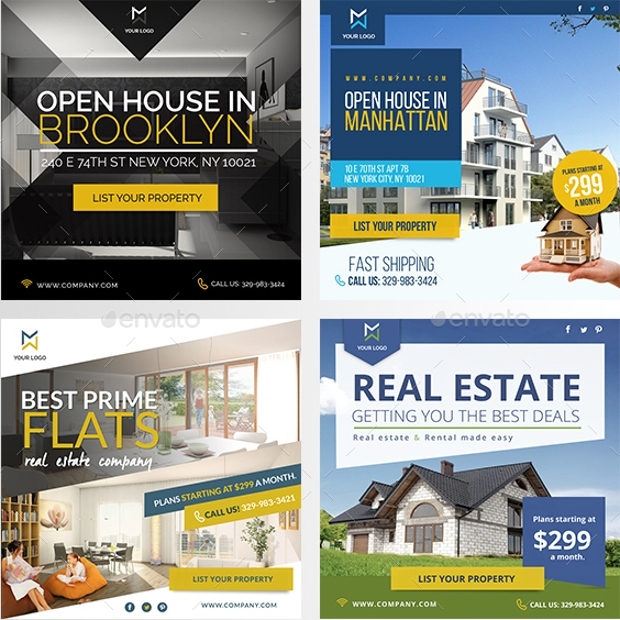 The pack of elegant templates featured here could be all that you need to promote your real estate business or agency to the next level of success. 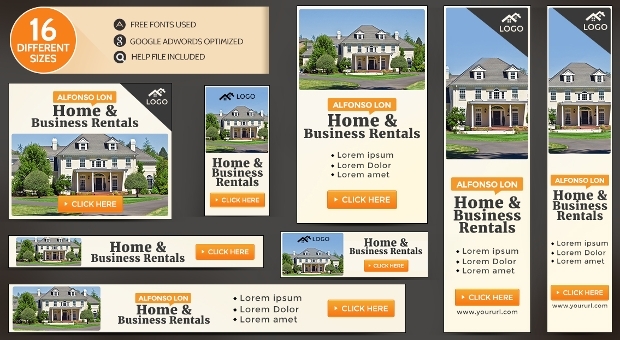 The neat design of these web banners makes them very attractive and ideal for advertising your business even in social media platforms such as Facebook. 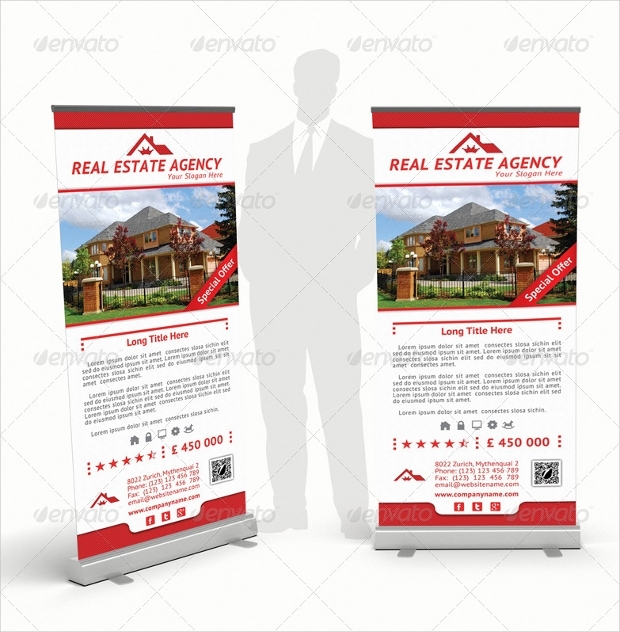 If you have been looking for an elegant roll up banner design to use in your real estate marketing, then this unique banner design is likely to bring your search to an end. This vector banner design is easily customizable. 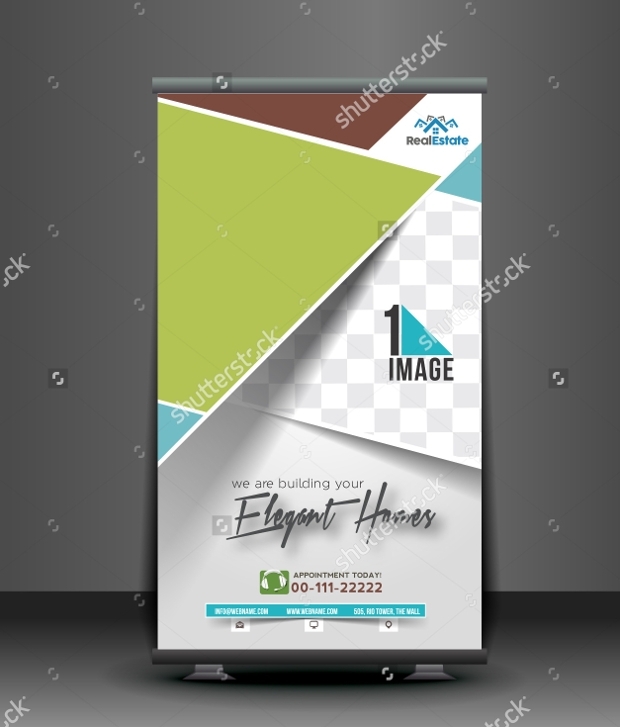 These templates could be all that you need to bring out your creativity in designing great banners for advertising your real estate business. 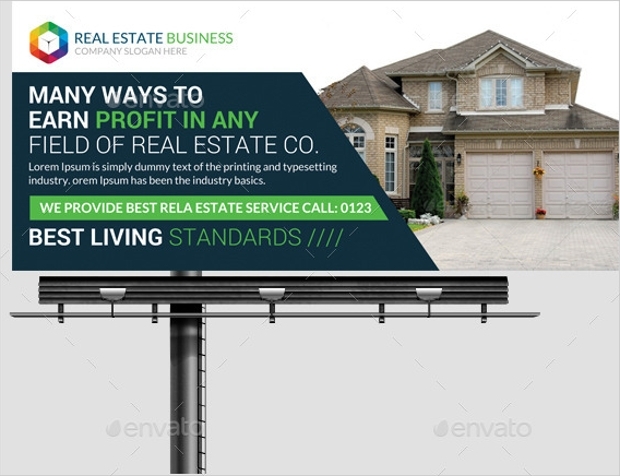 By following the appropriate Internal link anchor text, you will definitely find the template ideal for designing your real estate business banner quite easily in no time.